Some of us are lucky enough to live places with mild winters – 40 degrees and sunny is about the worst it’ll get, even in the deepest, darkest days of February. Others among us are not so lucky. Stuck in the Northern wastes where temperatures routinely drop below freezing in October or November and stay there through late March or early April, we learn how to dress appropriately – or risk literally freezing to death. There is something to be said for living in such harsh climates, though – it certainly teaches you about yourself, and the importance of not just dressing well – but dressing appropriately for the cold weather. Unlike our southern brethren who can eschew accessories like hats, gloves and mittens, scarves, and others completely, those among us who have to deal with the extreme cold know how to accessorize – both to look good and to survive the harsh winters common to our regions. In this spirit of helping out those of us who live where the wind is harsh, the days are short, and the temperatures rarely dip above freezing in the winter, we’ve put together a quick list of some of the best winter gloves for extreme cold on the market. Read on, and see how to protect your hands from the depths of winter. These gloves from Heritage are purpose built with extreme weather in mind – designed to be comfortable and wearable all the way down to -40F temperatures. Built out of a heavy-duty waterproof exterior, these gloves boast four barriers of protection, which includes a 70g 3M Thinsulate insulation layer bonded to a polar fleece exterior liner. This construction makes them totally waterproof and wind resistant, so they can handle even the toughest conditions. 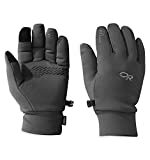 In addition, these gloves come with a zippered pocket for chemical handwarmers to aid in maintaining finger dexterity and warmth, and a tough palm grip and finger grips to aid in traction and friction in icy conditions. The index and thumb tip also have touchscreen-compatible technology, though it’s a bit tough to use in extremely cold conditions. If you need a good balance of bulk and warmth, these gloves by Heritage are a great choice due to their waterproof 4-layer construction and comparatively low bulk. Combine with a glove liner and your should be covered for all but the most extreme arctic conditions. These gloves by Carhartt provide extreme warmth and plenty of waterproof insulation, but at a cost – they’re quite bulky, and not suitable for tasks which require much dexterity, or for fiddling with small objects like cell phones and watches. What they are ideal for is outdoor work in the winter, or for long commutes or walks outside when the temperatures are not just below freezing, but below 0F. Their heavy insulation, large size with plenty of airspace and waterproof exterior will keep your hands plenty toasty when you’re outside for extended periods of time. These gloves are purpose-built to avoid the common pitfalls of other heavy-duty gloves, with extra-insulated fingertips (usually the first area to cool) and a tight, cinchable wrist area that can be tightened down to block wind and the elements from ingress, keeping your hands and wrist area totally warm. They’re bulky, but totally unparalleled if you need to keep your hands active in the cold, and need to perform for long periods of time. These gloves by Outdoor Research combine incredible warmth with a slim profile to create a glove that’s great for extreme cold, but doesn’t bulk up your hands, leaving you free to perform tasks that require plenty of dexterity. These gloves can easily perform in temperatures of 10F or below without heavy winds. Beyond that, you may want to consider something more heavy duty – or wearing these gloves as a liner with another pair of gloves for maximum heat. They’re also designed with the specific needs of winter glove wearers in mind – silicone grips on the palm and fingers help grasp icy objects, and a quick-drying 95% polyester construction isn’t totally waterproof, but does offer quite a bit of water resistance. These gloves probably aren’t for you if your hands typically get soaked, but if you need plenty of warmth and have to preserve the dexterity of your fingers, they’re a great choice. Ask anyone who lives in extreme cold, and they’ll tell you about the importance of a great glove liner. Glove liners usually take on the appearance of a “second-skin”, and are extremely tight against your hands allowing for maximum heat retention, and minimum bulk when wearing with other gloves. These liners by Terramar are a great example of what to look for when you need extra warmth with minimum bulk. Made out of 100% silk, they’re warm, breathable, and feature a ribbed spandex cuff and reinforced seams. The long wrist of these liners helps keep your wrist and gloves insulated, and their moisture-wicking technology helps keep your hands breathable and comfortable even when heavily insulated by a fleece glove that may otherwise cause excessive moisture. One drawback of silk is that it is a bit delicate – worn alone, these glove liners have a tendency to snag and unravel. This is mitigated somewhat by only wearing them as glove liners – wearing them alone, you can only get to temperatures of about 40F, so they’re not appropriate for cold weather on their own. However, if what you need is total warmth, and another layer of protection to keep your fingers nimble in extreme cold, you’ll want to pick up a pair or two of these liners. They go perfectly with every other choice on our list, and if you combine them together, your fingers will be warm and happy even in thermometer-cracking cold. Hopefully this list helped you find the gloves you need for extreme cold situations. Unlike warmer weather gloves, style points must usually be sacrificed somewhat when buying extreme-weather gloves – you can look as good as you want, but if your fingertips end up frostbitten, was it really worth it? Despite that, these gloves are unassuming, warm, and totally appropriate for just about any sub-zero situation. So grab a pair, warm up your hands, and get back out there. As the old Norwegian saying goes – “There is no bad weather. Only bad clothing”.